Villa to sleep 2-6 people with views of the mountains of Femes Playa Blanca. Tranquil location and only a few minutes drive from an array of beautiful beaches and excellent restaurants. Extremely well equipped with all the comforts of home. The lounge area opens onto a spacious private terrace with large private heated pool, sun loungers, outside shower, alfresco dining area, Internally, there is 1 large double bedroom with en-suite bathrooms, 1 twin bedroom, and 1 single bedroom. There is a further family shower room. The living room has a TV with satellite TV, including many English channels, 24 hour movies, news, cartoons, music etc. Other facilities include dishwasher and washing machine. Free wifi is available for the use of guests. Bathroom 1 with bath/shower over, handbasin, bidet and wc Bathroom 2 with walk-in shower, bidet, handbasin and wc. The living room is large and airy and double doors open out onto the large private terrace and private pool. There are 2 leather settees, 1 is a 3 seater, the other a 2 seater and an armchair. There is also a TV, Satellite TV, DVD player. The villa is suitable for young children as the garden/terrace area is enclosed and is also very private and not overlooked. It is also suitable for those with mobility problems as the property is all on one level. Doors are wide enough to accommodate wheelchair users. Notes on accommodation: The villa accommodates 2 - 6 people and is suitable for children and the elderly. There is a driveway with parking for 2 cars. A welcome pack is provided at no extra cost. A travel cot can also be provided if required free of charge Outside: The lounge opens onto a large terrace with table and chairs for up to 6 people for alfresco dining. The private pool is approx 7 x 3.5m, there are sun loungers, garden area, and outside shower. Pool heating. The villa is very private and has a large driveway to the front of the property, allowing space to park 2 cars. Utility Room: This room holds the washing machine, dishwasher, hoover, broom, mop and bucket etc. There is also an iron and ironing board. Cleaning / Towels / Linen / Maid service: All linen and towels are provided free of charge other than beach towels. A cot is also provided free of charge. The beds are made up for your arrival together with a free welcome pack and for 14 day holidays there will be a linen and towel change. Other: Separate dining room with table and seating for 6 people and a display cabinet. The terrace has sunbeds, a table and chairs for alfresco dining seating 6, garden area and large private pool. There is also an outside shower. We booked this villa at very short notice. Tracey was great with the correspondence & info. 4 days later we were in the pool – brilliant, if a bit manic on our part. We found the villa to be clean, spacious & well presented on arrival. A welcome pack was provided plus a bottle of fizz, complete with 2 cold wine glasses in the fridge. Much appreciated thank you. The villa is situated about 25 minutes walk to the town in a largely quiet & peaceful area. As this is a residential area for locals as well, we did hear a few dogs barking, but it never went on for long & didn’t bother us at all. The master bedroom has a king size bed which is very comfortable, as is the bedding. There is also a bolted down safe in the villa. We only used the shower in the main bathroom which always had hot water & a good pressure. The BBQ, dishwasher, oven & washing machine weren’t used, so can't comment on these. The kitchen is a little dark at night, but there are 2 lights in the extractor hood & we didn’t have any problems preparing meals. There is a built in seating area at the front of the villa which is perfect for an early morning brew & for catching the first rays of the day & enough off road parking for a couple of vehicles. The management staff we saw were friendly & informative. Steve, the pool guy was meticulous in cleaning the pool & making sure that the chemical balance was just right. The internet tv has over 2500 channels in many different languages. All BT sports, Sky sports & Movies are provided as well as Netflix & plenty of UK channels. We had a few problems with the connection at times & this is being looked into. There was a dvd player with a selection of films as well as a Wii with good games. A selection of books are also available. At the rear of the villa is the spacious tiled patio/pool area that has sun and shade all day long. There are 2 outdoor dining areas, one covered, BBQ, shower & scenic views to the mountains at the side. The sun loungers are due for replacement in the next few weeks. This area is also very private. The pool is fantastic & is very clean & warm. The metal steps have gone & new Roman steps with non slip treads have been installed. The pool is about 5 foot deep from one end to the other which suited us fine. The patio tiles were non slippery underfoot with wet feet. We really enjoyed our stay at this villa & would book again. The property was lovely however we were unable to use the pool due to the temperature and it being covered in flies. We would have expected a mid stay towel change in a 10 night stay however this wasn’t the case. Lovely villa in a quiet location. Conscientious and very friendly housekeeping and maintenance staff. Thoroughly enjoyed our stay and would certainly return. Outside space was great, very spacious and the pool was excellent, lovely and warm. We didn't have an adequate fan for the lounge when we arrived, Jo was contacted about the fan and came to the villa within the hour, and her quick response was much appreciated. Entertainment DVB we couldn't get it to work...cable...connected to tv via a scart lead, the volume had to be at 75 and there was a loud buzzing which made it inaudible. Dvd...perfect and a good choice of films. Wi-Fi ohh! dear, when it worked it supported Netflix but most of the time it didn't work. Most problems can be solved by unplugging the router, unfortunately the router is not in the house, it's in the villa next door, and we thought went the occupants went out they must have switched it off. The villa needs it's own router, and not just a repeater. A proper glass turntable for the microwave is essential, as the one that is provided moves about and could potentially become a hazard. These problems can be solved, and doesn't take away the fact that it's a lovely villa, and in a quiet area which suited us perfectly. It's about a 25 minute walk to the centre, if walking at a gentle pace. The taxi service is great, and only costs about 4 euros. Had a fantastic stay at the villa, everything you need to make you feel at home - very roomy, all bedrooms a great size. The outside space is large with plenty of room around the pool and very private. Good quiet location. Local contact Jo was great and easy to contact with any queries. Would definitely return - thanks very much! Excellent villa & pool, well equipped. WiFi erratic at times. Fantastic holiday villa. Brilliant pool, much deeper than expected, fine for our family with children 12-20+. The pool area is very private, not overlooked at all, which is fantastic. The beds are all very comfortable. Ceiling fans in 2 of the 3 bedrooms. A simple plug in fan would really make sleeping in the smallest bedroom much more comfortable. There was a tower fan/heater in the lounge but it was so noisy and ineffective it was useless as a fan. The WiFi, was erratic and simply stopped working at times. Jo, the local contact, was very helpful regarding this and advised us to unplug and plug the WiFi booster back in. With 5 people, including 3 teens, it was annoying at times but manageable mostly. Jo was great. She was very friendly and helpful and easy to contact. Lots of books, DVD’s, even a Wii! The tv is very limited in English Channels but that’s usual. We had a fantastic holiday here. We had a hire car which we felt was invaluable as it was quite a long walk into Playa Blanca, 25 minute walk at least. Playa Blanca has loads of excellent restaurants. Our favourite was La Rustica. Excellent food for good prices! Eating by the seafront was more expensive, but a nice experience. Loads of choice in cuisines. We loved Playa Mujeres, which is close to the popular Papagayo beach. Papagayo was heaving with people when we went. Mujeres was much quieter, with brilliant snorkelling. The best beach for us in the area. Definitely worth the 3 euros to enter the protected area. Our villa is perfectly located for those looking for a relaxing holiday away from the noise, hustle and bustle of a resort centre but close enough to benefit from the shops, bars, restaurants and beautiful Dorada beach just a 15-20 minute walk away. A five minute drive will also take you to the fabulous new Marina and also the infamous Papagayo beaches. The airport in Lanzarote is Arrecife. It takes approx 30 mins by car to Playa Blanca and is 35km away. Car hire is recommended, but taxi's are readily available for those who do not wish to drive. The port in Playa Blanca is 1.5km from the villa and provides a ferry crossing to the nearby island of Fuerteventura. By car you can drive around Lanzarote in a day. As Playa Blanca is at the southern most part of the island everywhere is north. 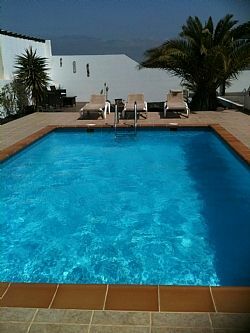 Costa Teguise has a great fun filled water park, an 18 hole golf course and is great for wind-surfing. Puerto del Carmen is the nightlife capital of the island, has many shops and loads of restaurants, clubs and bars, 20 mins by car. Playa Blanca has a pedestrianized town with plenty of shops, a supermarket, banks etc. Bars and restaurants are on the seafront. There is a promenade which leads along the front to The International Marina Rubicon. This is a brand new marina with very stylish shops and fantastic restaurants/bars. Some good art shops too. Leisure activities include jet/water skiing, diving, snorkeling, cycling, fishing, tennis, bowling, horse riding, wind-surfing, swimming, quad biking or just plain sun bathing. Also take the ferry to Fuerteventura, it only takes 15 minutes by sea cat and you do not need the car. Booking Notes: Rates shown are based on 4 people sharing. The villa sleeps 2-6 people if Z bed is used for extra person. Pool heating. A £200 non-refundable deposit is required to make a booking, with balance becoming due 8 weeks prior to departure. Discounts may be available for late bookings and for bookings for 2 people or less. Please contact for more information. Changeover Day: The changeover day is flexible depending on bookings. The usual arrival time is 2pm and depart at 10am but again this is flexible please ask when booking. Notes on prices: Bookings can be taken for 2-6 people and for 2 people a discount will be applied on the rates quoted other than high season when normal rates will apply. We also offer 10 day breaks contact owner for rates and availability. Rates shown are based on 4 people sharing. The villa sleeps a maximum of 6 people if Z bed is used for extra person. Changeover day is flexible depending on availability. The villa is normally available from 2pm on arrival and depart at 10am to allow for cleaning.